For the start of the documentary that we are producing for Snowbow productions, Des wanted London video shooting of The Docklands to show how it looks now. When compared to footage shot in the past. 8mm cine film clip showing the Docks of old. London film shots of The Docklands in the past. 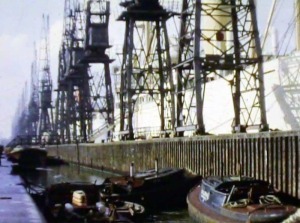 In the original 16mm film about the Old London docks a little girl is shown looking at the very busy old docks, crowded with cargo ships from all over the world. As far as possible we had to shoot the same scenes from the 16mm film in HD footage to show how the landscape had radically changed over the years. 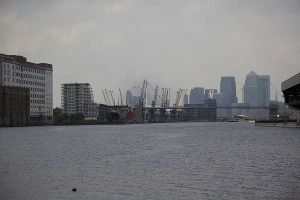 Picture taken by me showing the London Dockland area present day. Video below showing a plane taking off from London City Airport. This scene can be seen in the 16mm taken years ago when the port was full of cargo ships. We started the London video shoot at the Royal Dock down the river from the City area. Des Introduced the documentary by doing a piece to camera giving a brief history of the docks and about when he used to work on them in the past. Once the opening sequence was recored for the documentary we move on up the river to the Excell Centre to film Anna’s piece to camera where she explains how much the London Docks have changed since she was a little girl. Sound for the London video shoot. All the sound on the day of the London video shoot was recorded using Beyerdynamic radio microphones and monitored using closed back Beyer headphones. One tip to remember when using radio microphones is to position them near to the speakers chest because that is where the microphones pick the sound up from. Also if the Radio Microphones can be keep under clothing this helps prevent external noises being picked up. Video below showing a plane taking off from London City Airport which used to be the heart of the old London Docks. Link for the Museum about the London Docklands.